But look at that statement again: “There’s no such thing as absolute truth.” Isn’t that, in itself, a statement that’s being made absolutely? In other words, it applies some rule or standard to everyone across the board — exactly what the relativists say is impossible. They have undone their own argument simply by stating their case. The Rev. 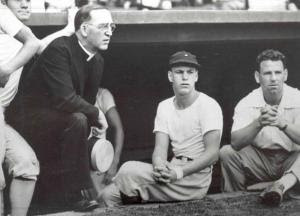 Edward Flanagan founded Boys Town nearly 90 years ago, and today his mission lives on. Now those who have studied him believe Father Flanagan should be a saint in the Roman Catholic Church. Flanagan founded the Orphanage for Boys in 1917. Since then, his organization has touched the lives of thousands of children. It’s a legacy that some believe makes Omaha’s best-known priest worthy of sainthood. It started with this reporting by Deacon Greg regarding Jack Chick tracts being passed out by a Baptist minister in Tennessee. One of Father Z's reader's alerted him to the following letter to the editor of the Diocesan newspaper in Knoxville regarding Father Flaherty, the priest interviewed in the original story. 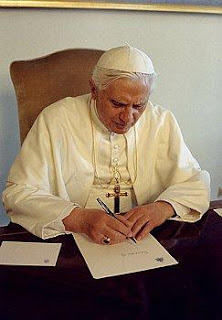 He began by explaining the Catholic Church’s rules for Mass and the Eucharist, and addressed parish volunteers. He reminded us of God’s presence in the tabernacle. There’s a family-life room for visiting, eating, and unruly kids, with Mass on TV. He ended by saying, “If you don’t like these changes, you can go worship elsewhere. You can complain to the bishop or go all the way to the pope.” As a priest, Father Flaherty is accountable for how he leads his flock to God. You could have heard a pin drop during his homily, but the congregation applauded at the end in agreement. He had hit the nail on the head. 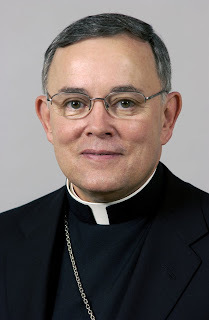 I hope his message resounds throughout the diocese. Saint John Vianney's Catechism on Confession is too important not to be shared here in its entirety. My children, we cannot comprehend the goodness of God towards us in instituting this great Sacrament of Penance. If we had had a favor to ask of Our Lord, we should never have thought of asking Him that. But He foresaw our frailty and ourinconstancy in well-doing, and His love induced Him to do what we should not have dared to ask. 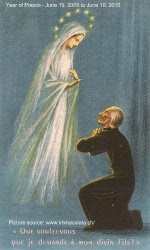 If one said to those poor lost souls that have been so long in Hell, "We are going to place a priest at the gate of Hell: all those who wish to confess have only to go out," do you think, my children, that a single one would remain? The most guilty would not be afraid of telling their sins, nor even of telling them before all the world. Oh, how soon Hell would be a desert, and how Heaven would be peopled! Well, we have the time and the means, which those poor lost souls have not. And I am quite sure that those wretched ones say in Hell, "O accursed priest! if I had never known you, I would not be so guilty!" always be a nasty smell. It is the same with our soul after confession; it requires tears to purify it. My children, we must ask earnestly for repentance. After confession, we must plant a thorn in our heart, and never lose sight of our sins. We must do as the angel did to St. Francis of Assisi; he fixed in him five darts, which never came out again. 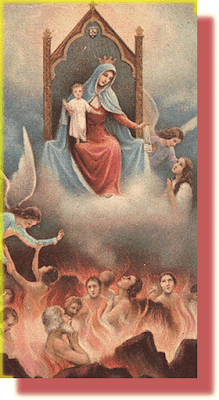 "Amid the fiery splendor of all the glorious seraphim, Mary was crowned Queen of heaven's Angels and Saints. But she is the Immaculate Queen of earthly sinners as well. 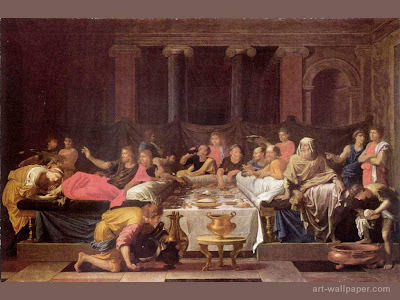 The world is full of her prodigal sons who scorn their Mother's house and waste their substance in riotous living, feeding their souls on the husks of sin. Meanwhile their Mother "watches from afar off," praying endlessly for their repentance. If they take one step only toward her, she runs the rest of the way to meet them. The grace of repentance, which Jesus won for sinners, is given to them through Mary. Habits of sin can be broken in Confession-if I have real sorrow. I should ask Mary for it often." From Father Patrick Peyton's 5th Glorious Mystery reflection in Rosary Prayer Book. The above reflection could have been written by Father Peyton with the young Donald Calloway in mind. By now, just about every Catholic should be familiar with Father Donald Calloway's incredible...actually, miraculous story of conversion. Some have referred to Father as a modern-day St. Augustine. In actuality, even at his worst, St. Augustine could not have been as bad a boy as then Donald Calloway was. I first heard Father Calloway's story on a DVD. Then Father came to personally give testimony on his conversion at two Divine Mercy Conferences on Oahu. In fact, when Father introduced himself to his audience, he noted that he did not think anyone had ever heard of him. My son and I were thinking "not true, Father, not true". At both conferences I asked around for his book on his conversion. Surprisingly, at that time, there was no book on his conversion! 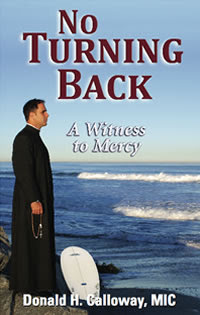 Father Calloway finally wrote about his conversion story in his new book No Turning Back. Let me tell you: this is no run of the mill conversion story. This is not a preachy conversion story with lots of scriptural references. Although I appreciate other converts' stories like that, I personally find it a bit boring. Father Calloway's book or story is not by any means boring! More than half of the book's 262 pages are filled with Father's past life and bad experiences. Right away Father starts off describing in vivid detail his infamous arrest and expulsion from Japan as a mere teen. As I read this part of the story, I was thinking to myself...."He would have been so punished, if he were my son!" Father Calloway has a writing style all his own. He writes as he speaks. He writes as if talking one on one to a friend. The book is an easy read not only because of the writing style, but because of Father's riveting life story. I had to keep reminding myself all his experiences happened before he was even 20 years old! Sometimes, Father's shares something that would just crack me up because I found it to be very funny. I am not sure whether or not Father meant it to be told in a humorous way, but he really had me laughing and sharing some parts with my whole family, which then had them laughing. Because I have heard Father speak in person, I am guessing he is naturally funny. The part I am referring to here is his time in jail in the United States. Another thought I kept having as I read the book is "I can't believe the guy in this story is a priest!" Although Father did not shy back when sharing his intimate details, he carefully used his words for the reader so as not to offend but I appreciated Father's candor throughout the book. Father really wanted to be quite honest and open in portraying his past. This fact will make his conversion even more meaningful and will really impact the reader, especially if you are not familiar with his story. Divine Mercy is so evident in the life of this now famous priest. It can only have been through God's Divine Mercy and of course, through Mary, that tough little guy, anti-Christian Donald Calloway, fully repented and gave his life to God and His Mother. Father Donald continues to spread the necessary and important message of Divine Mercy wherever he is or wherever he goes. It was at the first Divine Mercy conference that my son asked Father if he can now return to Japan. At that time Father said he did not know. For Japan's sake, I hope he can go back. For more information on Father Calloway or to order his book please check out his website here. I was going to write on the topic of pride. Instead, I am sharing what St. John Vianney has taught with regard to pride. Shared by my good friend, Lois. Louise shared the following novena with me. It is a new novena for me and I urge you to join in starting tomorrow. Thank you Louise. I found the Novena in its entirety over at Sacred Spaces where they posted it last year. 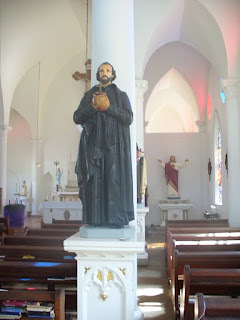 We invite you to join us and pray the Novena of Grace in honour of Saint Francis Xavier over the next nine days. It is traditional to pray the Novena for a particular intention; to ask for what you desire from God. 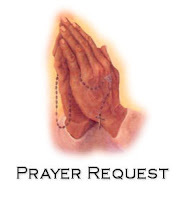 Pray for your own needs, those of your loved ones, or the needs of the world. You can keep a note of your intentions and have them appear in your Novena Prayer by using the link on the right. Although I have never seen nor heard Father Rookey in person, I am familiar with him and associate him with Catholics in Hawaii. That is because the St. Michael's Center for the Blessed Virgin Mary would invite father to come to Hawaii for the Marian Conferences, etc. Father Peter Rookey Being 92 years old, he does not travel much anymore. He does take phone calls if you want him to pray for you over the phone. The phone number is 708-748-MARY. Check out the complete over at Vivificat. 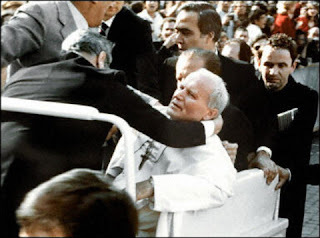 "Answer the Call, Young Man..."
I know just about every Catholic blog is or has posted this story of John Paul II's instructions to the medical personal, after he was shot and was waiting surgery. I am sharing it with you because it reminded me that when my father was dying, my mother gave the doctors and nurses repeated instructions to not remove my father's brown scapular, no matter what. My father died with his scapular on. It is almost a year since I shared the story of my father's happy death. He was not what one would consider to be a devout Catholic because he did not attend Mass nor did he go to confession in a long time. 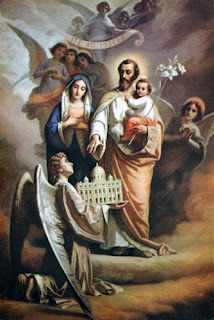 His dying with the Brown Scapular along with the anointing of the sick gave my mother and his children, the reassurance we needed and prayed for over the years, that our beloved husband and father would one day be in Heaven through the infinitely divine mercy of God. I shared the story of Pope John Paul II's instructions of not having his brown scapular removed, with my husband and mother yesterday. 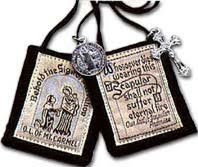 My husband told me that his dying father, who died two months after my own father, thanked the medical personal for letting him keep his Brown Scapular on. Unlike my own dear father, my father in law, was a devout Catholic. Yet, my husband too was very comforted knowing his father died with his Brown Scapular on. Thanks to my good friend Lois for sharing this article. 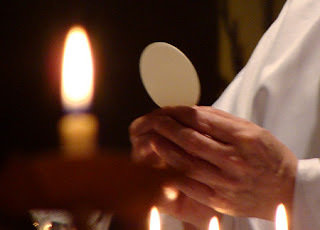 "...We come to confession quite preoccupied with the shame that we shall feel. We accuse ourselves with hot air. It is said that many confess, and few are converted. I believe it is so, my children, because few confess with tears of repentance. See, the misfortune is, that people do not reflect. If one said to those who work on Sundays, to a young person who had been dancing for two or three hours, to a man coming out of an alehouse drunk, "What have you been doing? You have been crucifying Our Lord!" they would be quite astonished, because they do not think of it. My children, if we thought of it, we should be seized with horror; it would be impossible for us to do evil. For what has the good God done to us that we should grieve Him thus, and put Him to death again – Him, who has redeemed us from Hell? It would be well if all sinners, when they are going to their guilty pleasures, could, like St. Peter, meet Our Lord on the way, who would say to them, "I am going to that place where you are going yourself, to be there crucified again." Perhaps that might make them reflect..."
This is not directed at anyone who finds that through their own circumstances in life, and through no fault of their own, MUST work on Sundays. "...Sunday is the property of our good God; it is His own day, the Lord's day. He made all the days of the week: He might have kept them all; He has given you six, and has reserved only the seventh for Himself. What right have you to meddle with what does not belong to you? You know very well that stolen goods never bring any profit. Nor will the day that you steal from Our Lord profit you either. I know two very certain ways of becoming poor: they are working on Sunday and taking other people's property..."